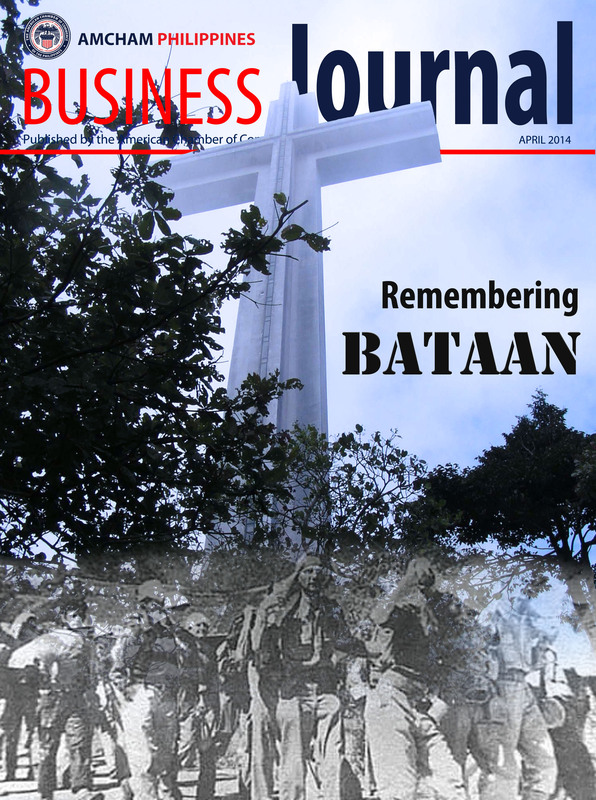 Originally published in the April 2014 AmCham Journal under the title, “Sequel to the Bataan Death March”. Reprinted here with permission. Bob Hudson, son of a survivor of the infamous Bataan Death March has quite a story to tell – and we asked him to allow us to tell it on our pages. 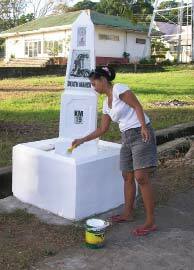 But first we mention that Bob and his Filipina wife Rosalie have become “angels” to the work of F.A.M.E. – the Filipino-American Memorial Endowment organization (F.A.M.E. 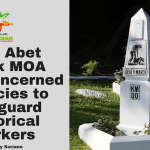 ); an organization under the auspices of the American Chamber of Commerce of the Philippines which is dedicated to the preservation of WWII memorials in the Philippines – and we tell a bit about F.A.M.E. here for the readers edification. There are a good number of monuments dotted around the Philippines, dedicated to the valor and bravery of Filipino and American military and civilian forces that fought the battles of WWII. Many of these were erected shortly after the war, when memories of these heroic events were still quite fresh. Some came later. All were meant to honor in perpetuity the memory of those who had made the ultimate sacrifice; grateful nations saluted their heroes in stone and metal. But the ravages of time and weather have taken their toll on the stone and metal. And, though memories were dimmed, the bravery was not forgotten; there was need to address the problem of the maintenance of these memorials by those of us who have come after. 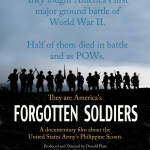 Thus, the Filipino-American Memorial Endowment, Inc. (F.A.M.E.) was initiated in 1986 – to endeavor to maintain these memorials and promote the remembrance of the US-PH shared heritage of WWII. In 2000 F.A.M.E. undertook a project to replace the 138 kilometer markers that Sequel to the Bataan Death March trace the two routes of the Bataan Death March. The project was completed in 2008. Despite all markers are now in place, the project continues. F.A.M.E. 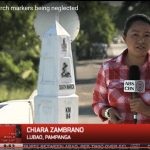 has to contend with barangay “artists” who use some markers as canvasses for their artistic renderings – and an occasional wayward jeep or truck takes down another. However, the biggest problem is the tropical weather; jungle heat and humidity give many markers a covering of black mold and green moss and thus there is constant need to monitor the markers to assure they are a fitting remembrance for sacrifices of life and limb. Bob and Rosalie heard about the organizations’ work and, with the impetuous to honor his father’s sacrifices as one of those who made the march, they entered into an agreement with F.A.M.E. 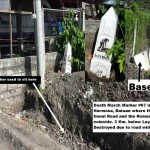 to help maintain the condition of the Death March Markers in Bataan and Pampanga. They have agreed to provide the labor while FAME provides the materials, and Bob (and Rosalie) personally scrape and re-paints 58 markers (out of 138) along the route. While working with Bob on this endless project, he told his unique story – not exactly of the Death March – but a poignant one that closely ties in with it. 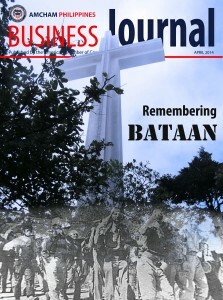 We have asked he share it with us – in honor of his Dad, and the recent 69th anniversary of the Fall of Bataan – the Araw ng Kagitingan (Day of Valor). It is a story of sleuthing – and missed encounters; his long search for his fathers’ daughter – his half-sister. “I retired in 2012 in the US and moved to Bataan, always having had an affinity for the area where my father served and survived. 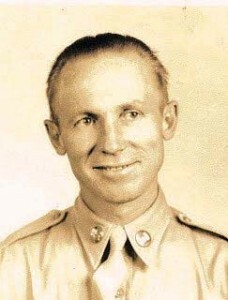 My father, Richard C. Hudson, was a survivor of the Death March and I have been a researcher for a number of years on the subject of POW’s in the Philippines and Japan. “Prior to war, my father was engaged to a Filipina and they had a daughter in 1939, while they awaited official US government permission to marry. When the Japanese attacked in 1941, my father was sent immediately to Bataan to set up and man the main Quartermaster dump near Lamao. “He was never to see his fiancée again; she was raped and murdered by the Japanese and his daughter thrown into an orphanage in Manila. In the meantime, Richard spent the rest of the war as a POW, first in Cabanatuan, Nueva Ecija, and later transferred by his Japanese captors on one of the infamous Hellships to serve out the rest of the war as a “soldier slave” in a POW camp outside of Nagasaki, Japan. “He was liberated in September 1945 and returned to the U.S. broken in health and spent six months recovering from his years of captivity. “In 1946, he made his way back to Manila in search of his fiancee and daughter. It was then he learned his fiancée was dead and his daughter had been adopted from the orphanage by a Filipino doctor; Dr Augusto Cortes and his American wife, Blanche Brinker. He arranged a meeting with the adoptive parents to discuss matters concerning his daughter. “After that meeting, he decided to leave her with them. She was almost seven years old and was much loved by her adoptive parents and settled in a good home. He left, after getting an agreement from the Doctor and his wife to send him photos of his daughter as she grew up and letters about her life. Her name was Leonida. He never saw her again after he left, but the doctor and his wife faithfully sent photos and letters for 14 years – until they inexplicably stopped. 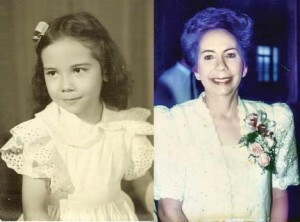 Hudson Leonida Cortez at age 5, and when she died in 1999. “The photo of my sister sat on my father’s nightstand until he died in 1988. The day before his death, he asked me to find her; I promised I would. However, at that time, there was no functioning internet. It would be years before any serious investigation could take place. “In 2007 I started my own blog about my father and his wartime experiences. I included an article and photo of his daughter and told of my search for her. Years went by and life took place. 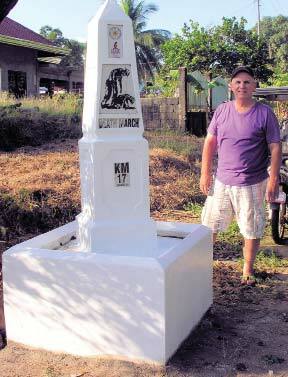 “I retired in January 2012 and moved here after meeting my future wife, Rosalie in 2011 while touring Bataan. Later that year, in November, I received an email from a Filipino who had read my blog and recognized the photo of my sister as a photo of his mother when she was a child! Eureka – his grandfather was Doctor Augusto Cortes, Leonida’s adoptive father! Sadly it was thus I discovered that my sister had died in 1999 of cancer. But –happily – she had left behind three daughters and three sons. My father had six grandchildren he never knew about. 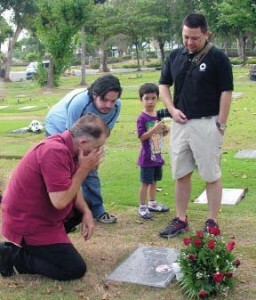 Hudson at his sister’s grave. “I now live comfortably in Limay, Bataan and follow my passion for remembering and researching on the Filipinos and Americans who suffered terribly in defense of this wonderful Island nation called the Philippines. “It is here where I will live out my life in the comfort of a warm and friendly people. I will continue, with Rosalie, to maintain the Death March markers as long as I am physically able. Donations can be made through the FAME donation page. Find it here.